Credit Card Import allows employees or employee administrators to import a credit card statement file and load those statement details into a saved Request automatically. Choose the desired templates. If a template is not already available for your preferred credit card vendor, one must be created. Speak with your InterConnect implementation consultant for more details. Load the selected templates to the Employee Portal website. To do this, copy the template files to the Employee Portal website’s /AppData/CCImportTemplate/ folder. Copy your template file into place. Shown here: Visa.template. 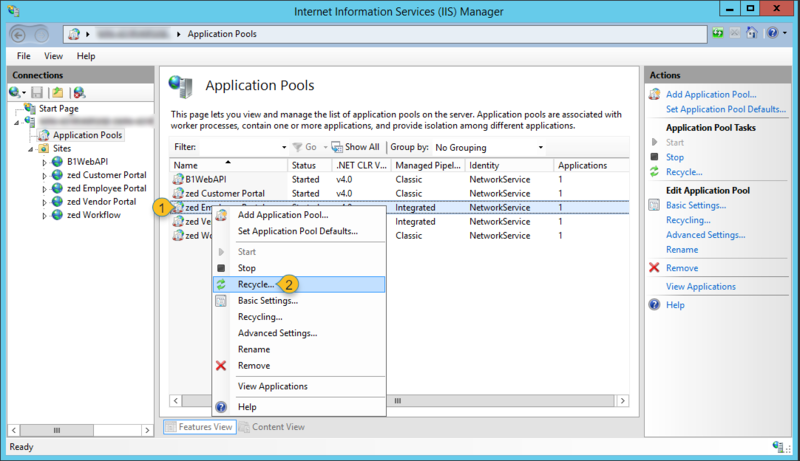 Recycle the Employee Portal website’s Application Pool in IIS. This will reload the updated/new template files. Recycle the application pool. Right-click on the application pool (1) and select recycle (2). 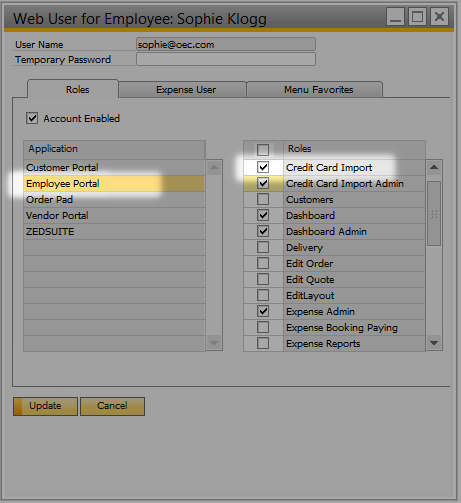 Configure Employee Portal web settings in SAP Business One. To do this, in B1, go to InterConnect Manager AddOn > Administration > Employee Portal Web Config and open the Expense User Setup tab. Place a check-mark in the Enable Credit Card Import field and Enable End User field. Enable Credit Card Import enables admin-level usage. This permits an admin to import credit card lines on behalf of other employees. The Enable End User option enables general employees to import their own credit card lines. In either case, roles must also be assigned to the admin/employee users to ensure they have access. 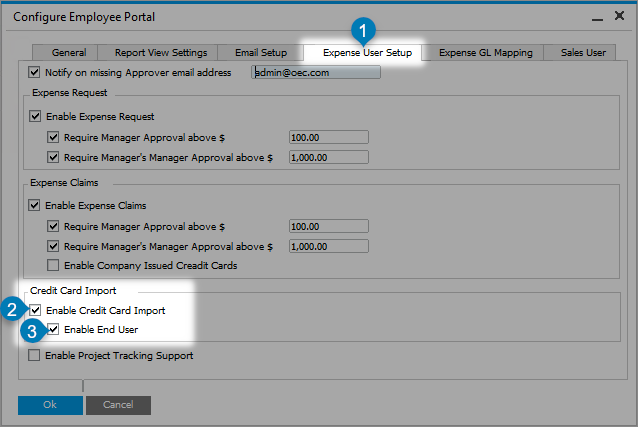 In the Expense User Setup tab (1), select Enable Credit Card Import option (2) for admin usage, and Enable End User (3) for general employee usage. 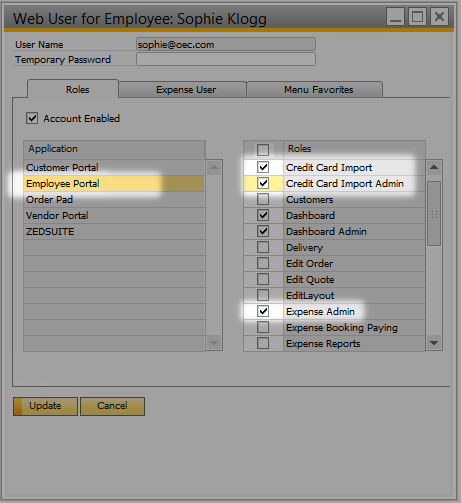 Configure Credit Card Import user access. Add the following roles depending on the type of user (for instructions on editing an Employee User, see Editing Employee Users). Enable the roles shown here for admin user import access. Enable the roles shown here for general employee user import access. Users may now import credit card lines.